When getting a cold is frightening! Now that I am just about over this cold I’ve been suffering with I decided to write about my first experience of an illness since my diagnosis. Something most people take in their stride but for me it meant the realisation that I cannot rely on my health like I used to. Not knowing how my body would deal with this was very unsettling. Even though I knew its very common at this time of year with the weather changing from summer to winter it was still a big reminder of my compromised health. It dragged on for two weeks and though I’m now happy that it was just a bad cold for the first week my thoughts were constantly dragged back to that fateful day in April 2015. The day I was rushed into hospital with what I thought was some sort of nasty flu actually turned out to be Acute Myeloid Leukaemia. When I first started to feel unwell I knew this would be the first big test for my new immune system and chemo battered body. Not only was I worried I had relapsed but, also would I end up back in hospital because my body was unable to fight off infection. Then I started thinking about the damage that the very toxic, high dose chemotherapy has done to my body. I know from other patients that its long term effects are life changing and it scares me to think of what might come for me. The insecurity of not trusting your own body’s ability to recover from an everyday cold was a real set back and yet another hurdle I’ve had to overcome. At times my mind would wander back to when I was in hospital, sick from the chemo, exhausted from lack of food and sleep. Having these symptoms again meant I had to be really honest with myself, my biggest fear is that if it comes back it’s more than likely a death sentence and very rapidly too. 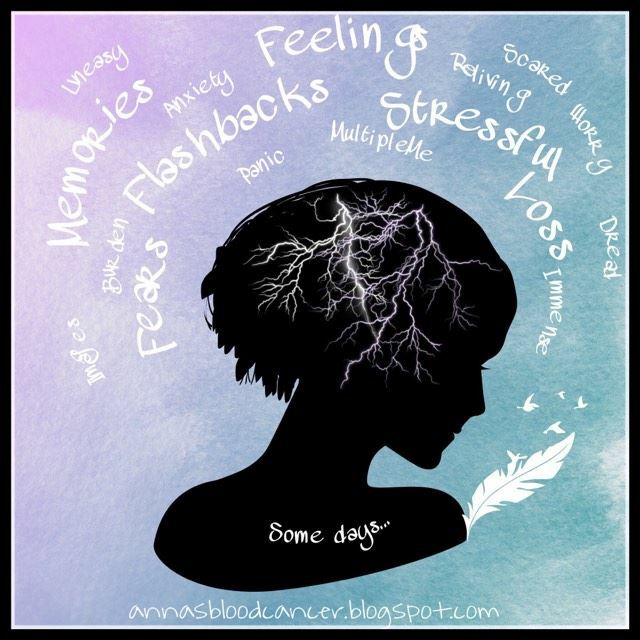 This is the reality of AML and why it is described as one of the most deadly of the blood cancers. With another cruel coincidence I started my period which had also happened last time and is a Leukaemia symptom if it is heavier than normal. I was kicking myself that I wasn’t sure if it was due or not as I’ve not really tracked it since being in remission…I now have an app so next time I can reassure myself. This tipped me over the edge and I ended up contacting my Macmillan nurse just for reassurance that I was letting my negative thoughts get the better of me. When I took some paracetamol I felt better meaning was running a temperature, a sign of infection and again a flashback to when I was in hospital. During treatment my temperature would be taken every 4 hours everyday, even through the night as Leukaemia severely compromises the immune system so any infection can be life threatening. If I spiked a temperature IV antibiotics were started immediately and blood samples sent to the lab. I wasn’t allowed to take paracetamol during my treatment as it could mask symptoms of an infection so when I was at home between chemo cycles the nurses really stressed not to take any. During my treatment so many everyday things became dangerous to me, even food (I was given a list by the nurses of foods to avoid because they carried bacteria), I became very paranoid about a lot of things. I stopped eating, drinking and even taking the numerous medications I had was very difficult. When they’d have to put me on IV fluids because of this I would be relieved as it meant I wasn’t forced to drink anything. I wouldn’t touch door handles, using tissues to turn on lights and taps! I think when these basic everyday things become the enemy it really messes with your mind and I still have the scars. Another blow came when I was unbelievably saddened to hear that a fellow AML patient who had been in remission had passed away. He’d relapsed and the end came very quickly…there aren’t words to explain how sorry I am this happened to them and as I was already feeling low and emotional it hit me hard so I cannot imagine how the family are feeling. So what for others is just an annoying cold for me was actually terrifying and another stark reminder that I’m in remission not cured. A diagnosis like mine is certainly life changing and in many ways. Thankfully it wasn’t the return of the Leukaemia…this time. I hope sharing how this felt for me helps others with similar experiences and that perhaps I will get to hear your feelings on this too?